This is a book about the indestructibility of love. Journalist and author Karina Machado spoke to over 60 Australians with stories of post-death contact. She shares their life-shattering experience of loss, and shows how their spiritual contact with a deceased lover, friend or family member brought peace, hope and the solace of knowing that their connection lives on. There is the story of a teenage boy who appears in bodily form on the eve of his funeral to bring comfort to his sister. A young husband returns to his widow in time to prevent another tragedy. A grandmother arrives to lovingly care for the infant children of her grief-stricken daughter. A man soothes his heartbroken brother with an otherworldly embrace. 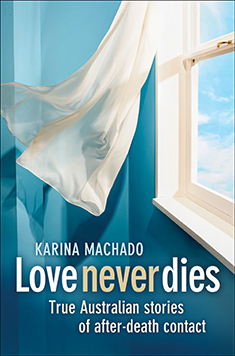 Written with grace and compassion, Love Never Dies is as much about the power of loving relationships as it is the phenomenon of the survival of consciousness beyond death.